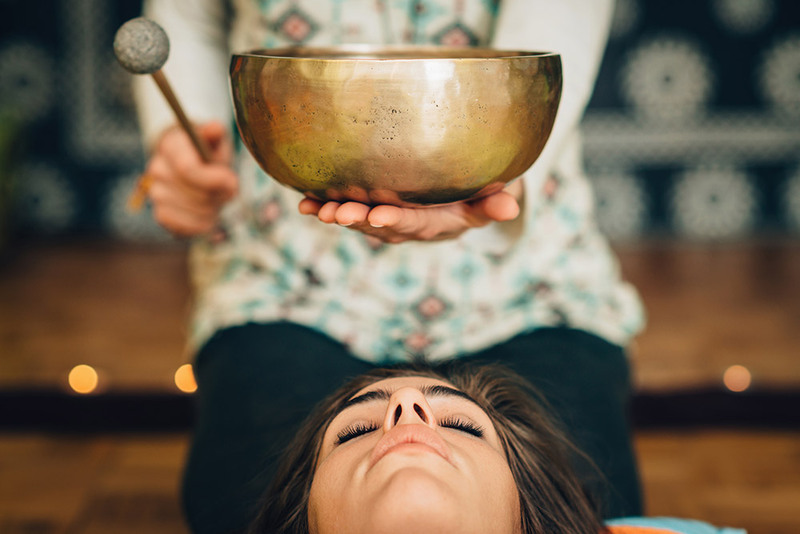 Ayurvedic Herbal Oil Massage (RMT)* (registered massage therapy) and Tibetan Bowl Sound Healing combined for deep rest and effortless healing integration of body, mind and spirit. Enjoy tranquility and peace permeating every cell during this full body massage and sound bath that reduces inflammation, pain and stress, promotes balance, relaxation and rejuvenation, initiates self healing abilities, relieves depression, anxiety, headache and insomnia, lowers blood pressure, left / right brain balancing, releases energetic blockages, stimulates cellular detox, aligns chakras, cleanses aura, increases immunity. Sound raises the vibration of the physical vehicle making the body and mind deeply relaxed, free of tension and at peace. With the body softened and the mind calm, one’s receptivity to divine insight, wisdom, and Light is strengthened as clients are fully immersed in the energy and purity of their Soul’s inner-truth, their mind’s expanded consciousness, and heart’s connection to Universal Love. Tibetan singing bowls – Resonance is the frequency at which an object naturally vibrates. Each part of our bodies has its own natural resonance, and vibrational medicine is based on the idea that disease is a result of those natural resonances getting out of tune – whether due to stress, illness or environmental factors. During these sessions Robert plays the bowls intuitively. He consciously responds to what he sees clairvoyantly in the auric field and receives clairaudiently as accurate information from Spirit and the bodies 7 major energy centres known as chakras. The session is absolutely attuned to the constitution and unique energy signature of the person he is working with so that clients are guaranteed a treatment that meets their individual need. Add / combine a therapeutic Herbal Oil Foot Massage (RMT)* and get your entire session covered through your health benefits plan. Sheena uses an ancient herbal oil massage routine in her treatments that are designed exclusively for women’s health, confidence and beauty. Her Ayurvedic approach to body-work provides nourishment, rejuvenation and relaxation for the entire body, mind and soul. This full-body massage naturally fosters self-love, self-awareness, compassion and body appreciation. In Ayurveda, massage therapy is considered an essential part of living a healthy, balanced life, and may be performed daily as self-massage, but for maintenance once a week is considered sufficient to remain fit and balanced. It generally takes 50 minutes to carry out the full treatment followed by 10 minutes of deep relaxation for integration. In addition to this (above) treatment, Sheena offers Intuitive Guidance for her clients either upon request or naturally as the sessions extends beyond the allotted 60 minute time frame. After receiving an impression from the physical body through body-work, Sheena navigates between the strands of genetic and cultural programming where belief systems, emotional patterns, familial stories and memories reside. Through a process of crucial questions, conscious communication and intuitive navigation she draws forth insight, guidance, and healing for her clients. Sheena addresses and surfaces subconscious stories and inner narratives which are inhibiting growth or causing stagnation in one’s life and body. Providing counter beliefs, dietary / lifestyle suggestions and empowering insights, she facilitates healing from the subconscious out. Purpose: to understand what is happening beneath the surface of normalized perception. Find under-lying causes of dis-ease and out-dated soul imperatives that affect wellbeing. Become grounded through personal insight, wisdom and clarity. Explore new dimensions and other ways of being in relationship with self, other and world.